Savvy Spending: FREE Little Caesar's Lunch Combo on April 2, 2018! FREE Little Caesar's Lunch Combo on April 2, 2018! 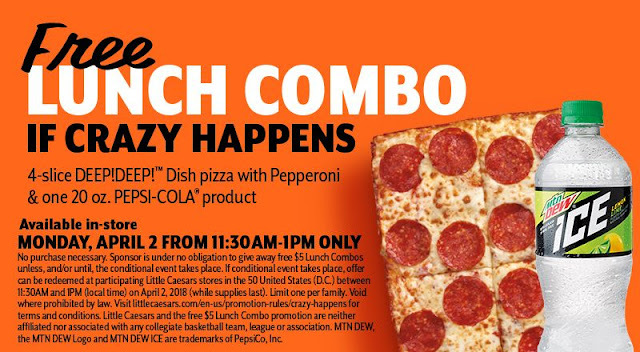 REMINDER: FREE Little Caesar's Lunch Combo on April 2, 2018! Little Caesar's announced that If Crazy Happens and a #16 seed beat the #1 seed in the NCAA tournament, they would give away free Lunch Combos! Well, crazy happened last night and we all win pizza! Yay! Stop by your local Little Caesar's on 4/2 from 11:30-1 pm for your FREE Lunch Combo!